The Blender animation system cannot easily load animations from one bone set to another. So I save all animations for a pet into one Blender file to compensate. I use Markers in the timeline to separate the animation: Markers are the yellow triangles (at 400) and the triangle at 425. You can right click a marker, and then G grab it to move it around. Markers are very useful in the Dope Sheet for selecting a set of keyframes to move them around, too. I make a text file to explain to myself what each animation market set is and what file name I saved it to. It is a lot easier to go back later and tweak the animation. Looped on upload at pri 4, needs to loop for AO use. BVH files are the standard Second Life and OpenSim compatible file format. But the Anim format has more bones! You get an extra skull bone, which is very useful for animating mouths, or ears, or anything attached to the head. The extra bones for feet and toes are not very useful. To use these extra bones, move them and save the movements in a ANIM file format. You must Bulk Upload these files. 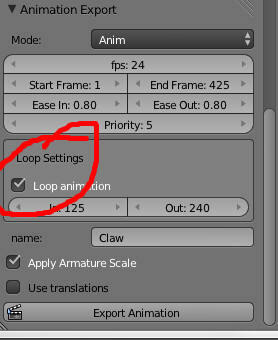 OpenSim will loop a Anim file if you set the checkbox in Blender. Second Life will NOT loop it.